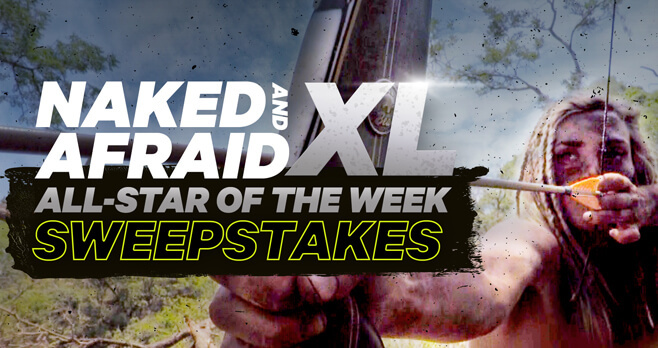 Discovery Channel invites you to watch Watch Naked and Afraid XL: All-Stars for a code word and a chance to win the Discovery Channel Naked & Afraid XL All Star of the Week Sweepstakes. Enter this week’s promo code at discovery.com/win and you could win awesome survival prizes. Who Can Enter? The Discovery Channel Naked & Afraid XL All Star of the Week Sweepstakes is open only to legal residents of the 50 United States and the District of Columbia and who have reached the age of majority in their state of residence and are at least 18 years of age or older at time of entry. When To Enter? Sweepstakes begins on Sunday May 13, 2018 at 12:00 a.m. ET and ends on Tuesday July 3, 2018 at 11:59 p.m. ET. What Is The Sweepstakes Prize? The Grand Prize consists of a Discovery Swag Pack that includes a Yeti Rambler Bottle, Canvas Backpack, and a Compass Bracelet. Who Are The Sweepstakes Winners? To receive a list of winners, mail a self-addressed, stamped envelope to be received by Wednesday August 8, 2018, to The Naked & Afraid XL All Star of the Week Sweepstakes Winner List, One Discovery Place, Silver Spring, MD 20910.